Sound engineers combine ingenuity and science to make up their bag of tricks. THEY were dissecting the brain of Nicolai Leninâ€”on the radio. It was a news broadcast of the achievement of the Soviet Brain Institute in Moscow which had developed a means of slicing brain tissue into thousands of paper-thin fragments for scientific study. “Give us the sound of a brain being sliced,” came the bizarre order to the sound effects department of the Columbia Broadcasting System. The broadcastâ€”it was on the “March of Time” programâ€”was to go on the air within a few hours. 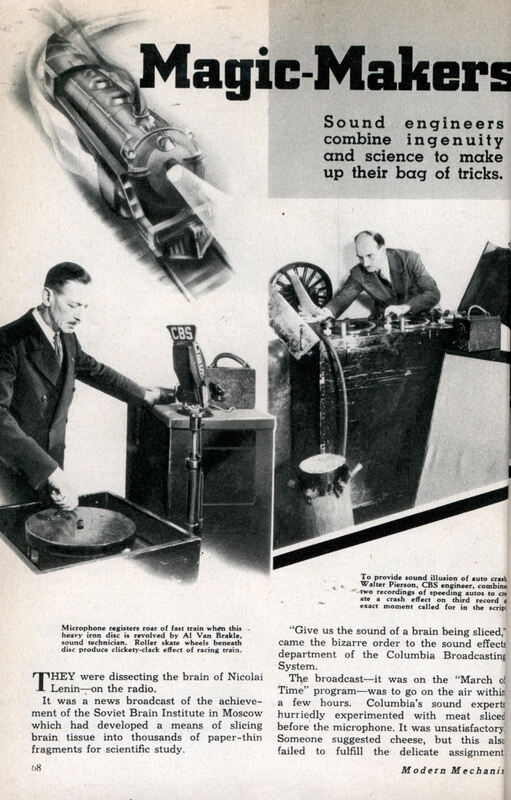 Columbia’s sound experts hurriedly experimented with meat sliced before the microphone. It was unsatisfactory. Someone suggested cheese, but this also failed to fulfill the delicate assignment Liverwurst was tried and discarded. Finally Walter Pierson, Columbia’s chief sound man, smiled with satisfaction. He had it! The broadcast was given on schedule. The “brain” of Nicolai Lenin, sliced within an inch of the microphone with a realism that satisfied several million listeners, was a slightly over-ripe banana! This is but one incident, selected from hundreds that complicate the inventive lives of the sound experts, which serves notice on the radio fan that he must be prepared to discard all preconceived notions of how sound effects are produced. For during the last few months the art of the sound effects man has changed so drastically that the chances are whatever you have read about his unique business is obsolete. Today the sound man has become the scene-setter of radio. The movies long ago discarded the painted canvas background for the elaborately constructed set. Just so, the modern radio sound effect is a composite thing designed to create a visual image. The days when a few phonograph records, a thunder machine, and a door for slamming purposes constituted the sound equipment of a studio definitely belong to radio’s youthful, past. The new methods by which the network broadcasters produce their effects are fascinating. Ray Kelly, head of the National Broadcasting Company’s sound effects department, has invented hundreds of devices for this purpose. His latest creation is a new thunder machine which can’t even be heard in the studio! It is an ordinary window screen mounted in a frame, with electric wires connected to the mesh and passing through a switch to the microphone. When Kelly strikes the screen with a soft mallet, the sound is inaudible a few feet away, but the microphone picks it up intensifies its lowest vibrations into the roll of thunder that is stormy weather at its worst. The sound effects man has to know the possibilities of the microphoneâ€”its ability, for instance, to broadcast inaudible sounds by picking up certain vibrations which can be intensified in the control room. He also must have a retentive ear and more than an average allotment of mechanical imagination. The ideal sound effects man has been described as one who, honked at by a taxi in the street, registers the sound of the horn before he jumps. All too often the expert does not even have the advantage of hearing or analyzing the sound he is called upon to reproduce. A surprising number of radio effects are sounds never before heard by mortal man. 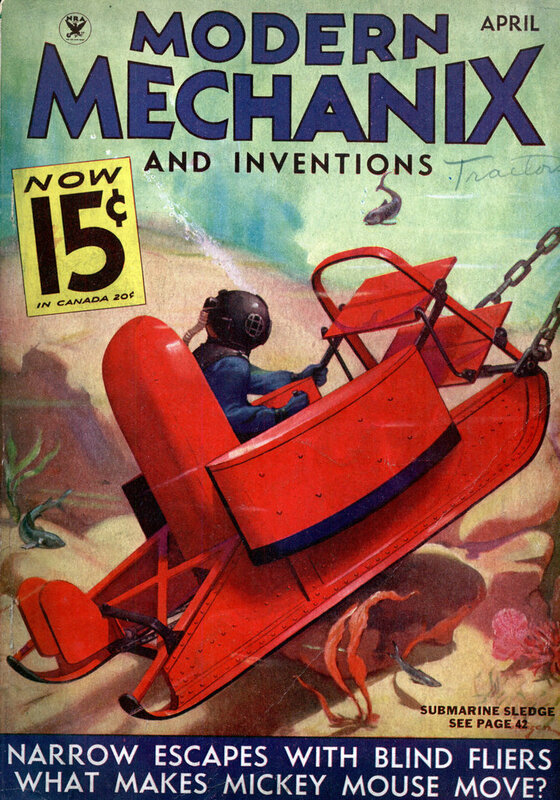 One of Kelly’s assignments was to produce the sound of an, as yet, uninvented steam airplane motor on a program presenting scientific advances of the future. With a length of rubber hose, he hooked a container of compressed air to a model airplane propeller and the sound effect was perfect. A similar assignment came the way of Walter Pierson of Columbia. In the “Cavalcade of America” program the script called for a reenactment of the run of the original locomotive of the New York and Hudson railroad which ran 25 miles up the Hudson river and then blew up. He read descriptions of the catastrophe, and used a heavy iron disc running on wheels like a merry-go-round to recreate the clatter of the suicidal engine. Not all sound effects require ingenious mechanical devices. In the enactment of a news broadcast describing a blood transfusion operation, the sound of dripping blood was required. Water was tried and found too thin. Clam broth fell short of requirements. Tomato juice was the substance finally used. It is notable that, where a few years ago radio shied away from effects tending toward the gruesome, today there is a pronounced trend toward realism. The emergence of radio drama and the popularity of news features must be credited with the development. A case in point was the radio story of the beheading of criminals in Germany not long ago. No detail was omitted, but the radio audience would have been spared its shudders if it could have been present in the studio to observe that the victims on the block was a mammoth piece of bologna sacrificed to the knife. In Poe’s story “The Tell-Tale Heart,” the reader may remember that the criminal who has murdered a man and buried him beneath the floor of his home is finally driven to confess by the obsession that he can hear the dead man’s h2art thumping accusingly. In the radio presentation, the sound the audience heard was the actual heart-beats of a husky six-footer, amplified through a stethoscope. Accident is responsible for a number of unique sound effect discoveries. A sound effects technician, making a department store purchase, flexed and unflexed a dollar bill in her hand. To you or me it would sound like a dollar bill being snapped. But to her it was the put-put-put of an outboard motor, and so it proved to be when she hastened back to Columbia studios to try it out before the mike. A studio wit suggested that at that rate a ten-dollar bill should be able to reproduce the sound of an entire outboard regatta. The most satisfactory way to insult a sound effects man is to imply that he uses “canned” effectsâ€”phonograph recordsâ€”because he is unable to reproduce the sounds in question. Forty per cent of all sound effects actually are supplied by records, but the expert maintains that this is merely a matter of expediency. It is a touchy point of pride with him that he can create any sound known to man. It is perfectly within his capabilities to produce the sound of frying bacon, popping corn, perking coffee, and the like, but it saves time to rely on records for these effects. The well-equipped studio record library contains some 150 discs, carefully indexed. These are made by a special recording studio which makes a business of supplying sound effect records to broadcasting stations all over the country. The aid of records, however much the true artist may disdain them, is a matter of necessity when one considers that certain script shows (which is the radio description of dramatic plays) are one-third dialogue and two-thirds sound effects. “Renfrew of the Mounted,” the story of a Canadian mounted policeman, holds the record at Columbia for its demands on the sound department. Five men work all day, five days a week, preparing the sound effects, rehearsing them, and presenting the show. If the script calls for horses stampeding, they cannot be satisfied by reproducing the beat of hoofs and letting it go at that. Modern technique calls for a sound picture of the entire scene. Thus to the beat of hoofs is added the splash of water as the horses rush through a river, the muffled thud as they reach the sandy shoreâ€”the whole panorama must be constructed for the listener. One persistent story regarding the sound man deserves to be scotched once and for all. You have probably heard it. It goes something like thisâ€”the script calls for the sound of someone cracking peanuts. For days the sound department drives itself into a frenzy trying every imaginable means to produce the effect. They snap wood, break lead pencils in half, crackle paper and tear their hair. Finally someone suggests that they try cracking peanuts, and lo!, it is the perfect effect which has so long eluded them! It is not to be denied that such rejections of the obvious have occasionally occurred, but for the most part they are just good newspaper stories. The first consideration of the sound expert is whether or not the desired effect can be produced by natural means. In a surprising number of cases he goes to great pains and expense to produce the effect in just that way. The Lux Radio Theatre program called for a pier in the East River with old, worn planks over which a wagon drawn by two horses rolled and rumbled. Out of the well-equipped workshop of the sound department came an actual pier in miniature, which was set up in the studio. Its heavy boards creaked realistically when they ran a real wagon over it. Three men were needed to produce a few seconds’ sound-illusion on the air â€”one to give the sound of hoofs, another to take care of the creaking pier, and a third to manipulate the wagon. The sound of a compressed-air drill is made by a compressed-air drill. Ten-gallon milk cans delivered from a milk train are actual cans rolled on a platform. The National Cash Register Company supplies a new cash register every month to each of the New York studios for the authentic jingle of this interesting accessory. Typewriters, alarm clocks, and doorbells are present in the flesh. Columbia has fifteen French taxi-horns, each guaranteed to blare an individual bellow. In the “spook” division of the sound department, devoted to the radio interests of ghosts, phantoms, and supernatural menaces, the visitor will observe row upon row of chains, each with its distinctive clank. “Creaks” come in a variety of mechanical assortments. They are made by mounting rusty hinges on wooden frames and by the use of selected woods in varying combination. Thus, upon order, the sound department will deliver a hesitant modest creak, appropriate to a wandering lady ghost, or a spine-chilling crepitation suggestive of Dracula at his worst. Crockery mortality in the network studios is appalling. Both NBC and CBS buy dishes by the barrel and break them recklessly, not only in domestic dramas but for general crash purposes as well. A gross of platters dropped from a six-foot elevation can be almost anything from a landslide to a train wreck. Indispensable, too, are small fruit boxes of the type used to pack strawberries. The brittle wood, crushed before the microphone, can be the crackling of a forest fire, the destruction of colliding automobiles (plus shattered dishes for crackling glass), and has even been used to simulate the breaking of a human neck and other emergency purposes. These stock items, plus the record-playing machine, a collection of doors of all kinds for slamming purposes, and a rain and wind machine are standard equipment in every well-equipped studio. Ray Kelly is the inventor of a new rain machine which can reproduce every pluvial variation, from an April drizzle to a China Seas typhoon. As a gadget it suggests a Rube Goldberg contraption at its most fantastic. Grape seeds, marbles, a ping pong ball, cellophane and peanut bags are the amazing ingredients assembled by the Kelly genius to produce radio rainfall and nothing else. The grape seeds are the raindrops; they are distributed on a revolving disc and scraped off by a windshield wiper, directing them in a falling stream upon a marble a foot below the disc. Some of the seeds bounce off the marble and strike a suspended ping pong ball, dropping upon a sheet of cellophane and tumbling down it to beat upon a glazed bag which originally contained salted peanuts. The rest of the seeds pepper a tightly stretched bit of onion-skin paper. A tornado is air escaping from a rubber balloon. Marching soldiers are wooden pegs strung loosely in a frame so that they may beat upon a sounding board in irregular rhythm. A whirring factory is a series of gears driven by an electric motor. An airplane engine is a rubber strip whirled on a motor shaft. But no single one of these devices is so self-important as it used to be not very long ago. Today they are simply the elements out of which the expert builds his composite sound picture. That is the new radio technique. Interesting note at the bottom of the 7th page. They propose using kudzu as a useful forage crop.